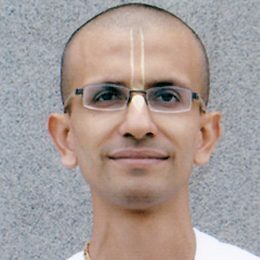 Sri Vasudev Keshav Dasa has been serving the movement as a full-time missionary with ISKCON Bangalore since 1998. He takes care of the Deity department, and offers his guidance for the execution of various departmental services and projects. This includes daily puja, other special ceremonies and rituals performed on the occasions of different festivals over the year at the temple. Srila Prabhupada taught his disciples the most important aspects of Deity worship. They are cleanliness, punctuality, and offering the Deities admirable costumes and a delicious menu every day. Sri Vasudev Keshav Dasa ensures that a high standard of Deity worship and other rituals are achieved on a day-to-day basis. He is also the Director of NIVE (National Institute of Value Education), which conducts Values Plus, a program to impart Value Education to students in schools.